Maintenance Pro and Fleet Maintenance Pro provide over 100 standard built-in reports. These cover a broad range of needs, including equipment information, maintenance history, services and expirations due, fuel usage, and more. If these template reports do not quite fit your needs, you can modify existing reports, or create new from scratch using the Custom Report Designer Add-on Module. The report designer enables you to modify layout, adjust formatting, or insert a logo, and gives you the ability to add, edit, and delete from existing reports. 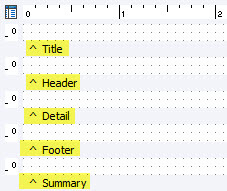 Choose from a predefined selection of data fields in the database tables the report is based on. 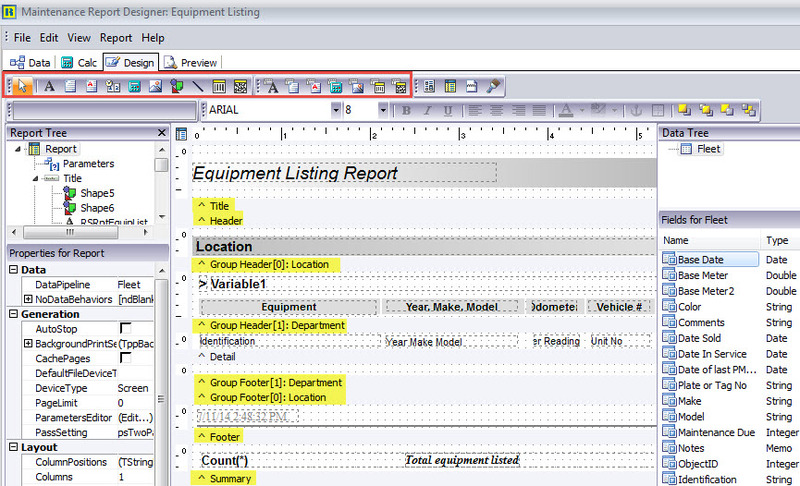 It also adds the option to make new reports, or add fields to any report that are not part of the predefined selection. A "wizard" tool will guide you through the report design process. You will also have full control to rename and categorize all reports in the system. Advanced users will be able to edit SQL code. Access the Design workspace by clicking the Reports icon on the main toolbar, selecting the report you wish to modify, and clicking the "Customize" button at the bottom of the Report Viewer window. If you do not have any experience with report building software basics, such as creating fields and labels, you may find it helpful to review the linked resource " Learn Report Builder"